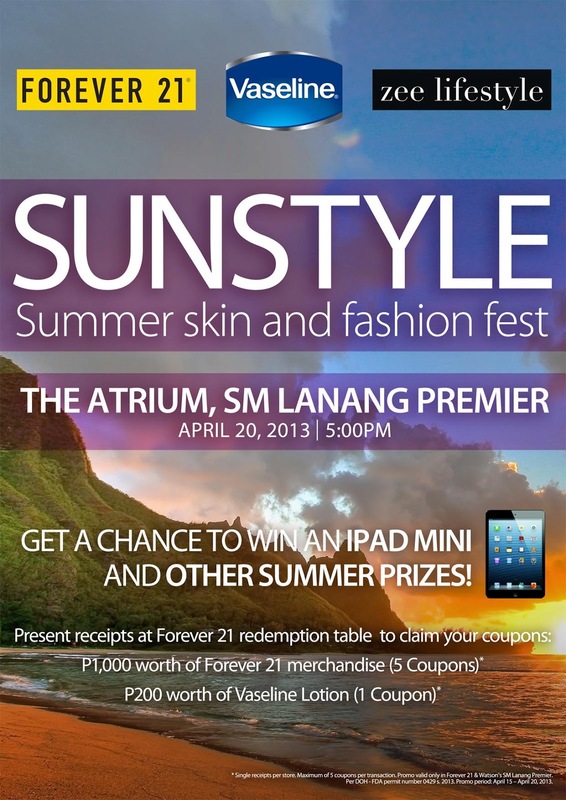 FOREVER 21, VASELINE AND ZEE LIFESTYLE will stage 'Sunstyle Summer Skin and Fashion Fest' at the Atrium of SM Lanang Premier on April 20 at 5PM here in Davao City. Get a chance to win an iPad Mini and other great summer essentials. Here's how; For every P1,000 worth of Forever21 merchandise entitles you to 5 coupons and for every P200 worth of Vaseline lotion purchase entitles you to one coupon. All you have to do is present your receipts at Forever21 redemption table to claim your coupon and join in the raffle.